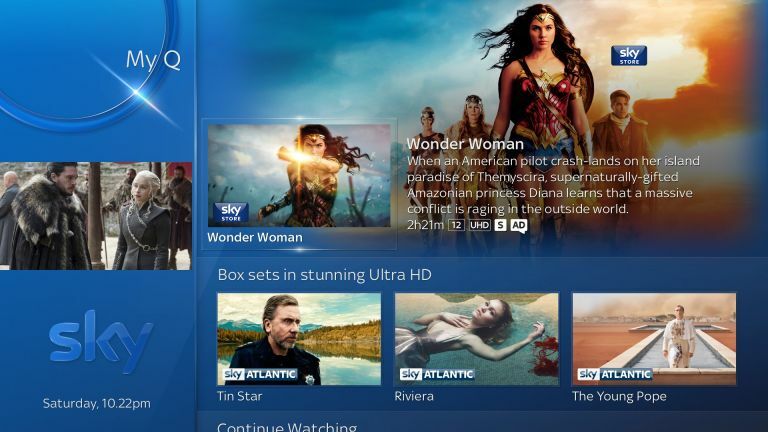 Sky has said it will shortly roll out update 5 to Sky Q boxes. This new build of the Sky Q platform gives voice a significant part to play - not only can you search using your voice (as you could previously) but you're now also able to control much more for everyday use. Using the voice button on the Sky Q touch remote you can now change channels, jump straight to your recordings or another section of the EPG, rewind a goal (or forward through the adverts) using voice commands. If you have a Sky Q 2TB box there's also going to be a dedicated Ultra HD section within the My Q area. Also launching as part of the latest software update is a ‘Favourites’’ menu in the channel guide - this was a much requested feature that customers liked with Sky+. You can add up to 99 channels and the box will suggest your top channels for you. Roll-out will be phased, so there's no exact launch date. You will need a Sky Q touch remote (because of the dedicated voice button) and any Sky Q box that’s connected to broadband to use Voice Control. What voice control commands can I use with my Sky Q box? · Pressing ‘11’’ on their remote control to tune in to their first favourite channel when watching live TV.. Or press ‘22’’ for the second, and so on. · Swiping or pressing left in the Mini Guide to select Favourites and browse through the channels from there. · Scrolling through the list of channels and making a selection from the Favourites menu within the existing TV Guide.